The SYRIZA-ANEL coalition on Thursday night voted for the harsh austerity measures required by Greece’s creditors amid strong reactions from the opposition and thousands protesting outside the House. All 153 lawmakers of the two ruling parties voted for the measures while the remaining MPs either voted against or abstained. Outside the parliament building, unions and individuals protested against higher taxes and security contributions, pension and wage cuts, and changes in labor laws. The main public sector employee union (ADEDY) protest rally at Syntagma Square started at 6:30 p.m., despite the serious transportation problems and rainy weather. Thousands of people shouted slogans against austerity and the government. 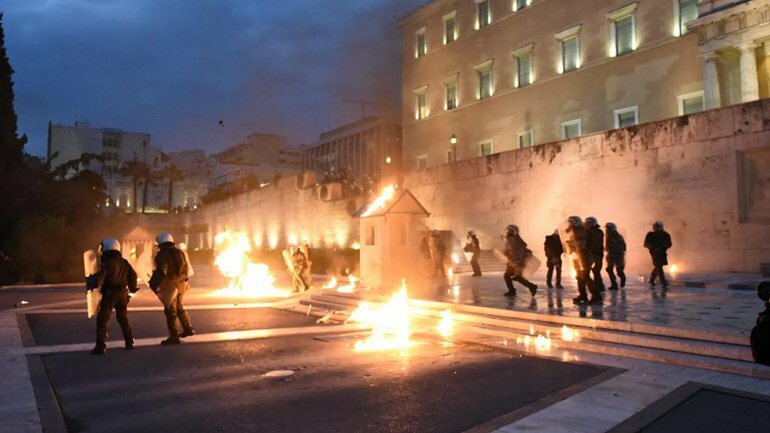 The dmonstration was peaceful when suddenly, at 8:45 pm, a group of hooded people started throwing molotov cocktails at the Monument of the Unknown Soldier guard, setting the post on fire. Prime Minister Alexis Tsipras and main opposition New Democracy leader Kyriakos Mitsotakis exchanged accusations. Both men called each other a liar, with Tsipras saying that Mitsotakis took the side of the creditors during negotiations and his opponent telling the prime minister that his two-year rule destroyed the Greek economy and led Greece to poverty, and asked him to resign. 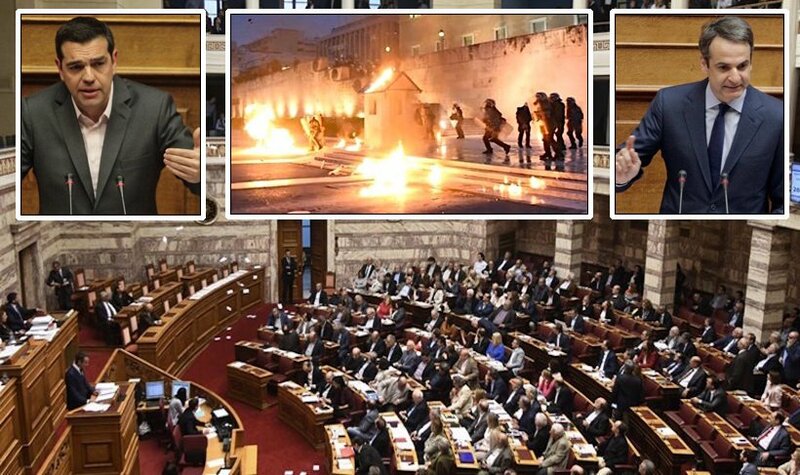 All opposition parties criticized harshly the new measures and accused Tsipras of cheating Greek people by telling them that the country is coming out of the econmic crisis when in fact it is sinking deeper into recession.